Horror is a visceral medium. When it comes to movies, horror can be very visceral indeed. I love the old Universal monsters, mainly for personal reasons. They are my favorite. When it comes to other horror movies I lean towards surrealism like the excellent Suspiria by Dario Argento. But there are other movies that, after you see them, change you in some way — and not always for the better. I Spit on Your Grave is such a movie, along with Texas Chainsaw Massacre, Halloween, and The Hills Have Eyes. Though a slick mainstream movie, I would place The Exorcist in that same category. 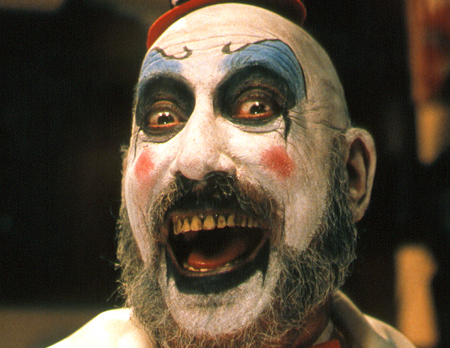 House of 1000 Corpses is another one. This is a movie written and directed by Rob Zombie. There’s a ton of in-jokes and black humor sprinkled throughout this film like lost spatters of black blood topped with glittering candy sprinkles. The comedy is dark, very dark. But, there’s fun here, too. The main characters are named Captain Spaulding, Otis Driftwood and Rufus Firefly. All names from Groucho Marx characters. Plus, Karen Black plays the matriarch of the Firefly family with outright verve and gusto. Hell, that’s a selling point right there. Zombie wanted this to be an homage to the horror films of the ’70s. He originally wanted to make the film with the same equipment and technology available to directors at that time, but money and creative pressure got in his way. There’s still a lot here to entertain. And, despite the body count and the buckets of gore, this film is very entertaining. Quick cuts of old black and white horror movie hosts and off screen monologues by principle characters a la Natural Born Killers keeps us confused and riveted. Judicious use of sound, color, and a fantastic music track make the experience memorable and upsetting. The movie starts with four teenagers are on a road trip across America writing about weird places tourists might want to visit. In a shithole town in the Deep South they learn of a local legend called Dr. Satan. In the interim they stumble across a family of freaks. Oh, and it’s Hallowe’en Eve. So far it’s your normal horror-type movie fare, right? Wrong. From the candlelit dinner, to the tortured cheerleaders upstairs, to the ersatz floor show, we are on a mind-numbing roller coaster ride…and it gets more claustrophobic with each twist and turn. The police show up. They’re whacked by the freaks, and one of the deputies is killed in what has to be the longest suspenseful pause in moviedom as the action reverts to slow motion, the camera flies away in the sky, yet we cannot turn from what we know is going to happen. It is the distance which Zombie forces us to watch, not the murder itself, that is the true horror. But what of our four young friends? Well, it doesn’t look good. One of the male characters is asked by Baby to guess who her favorite movie actress is. Oh, and she’s holding a straight razor in case he gets the answer wrong. He guesses Marilyn Monroe. Nope, it’s Bette Davis. Fitting she would choose such a notorious man-eater. Baby commences to scalp the young lad while she giggles. I’m just saying that’s not something you see everyday. The other poor fellow, well, let’s just say “Fish Boy” and leave it alone. The two girls are then dressed in bunny suits, along with our scalped friend, and taken outside on Halloween night for more fun and frivolity. Teenagers dressed as bunnies on a night when they are to be tortured and murdered. That’s not something you see everyday, either. One of the girls runs. She’s chased down by Baby and stabbed. Baby licks her knife under the light of a full moon. The other two are thrown in a casket and lowered into a well. The tortured victims from the past who are living down there reach out of the black water and drag them out, but one girl escapes. She finds a tunnel and, still wearing her bunny suit, goes deeper into the black earth. Shades of Alice in Wonderland…except what she’s found is a labyrinth of 1000 corpses, past victims of the Firefly family. She loses her bunny suit and stumbles into the lair of Dr. Satan. Wow, he’s not a legend after all, who would have guessed? But he’s deeply involved in an “experiment.” She escapes his axe-wielding associate, crawls out into the daylight and a car comes down a dirt road to pick her up. The denouement is typical, and most horror movies would end the shenanigans right there and call it a day. But Zombie isn’t done with us quite yet. Our heroine awakens — only to find herself strapped to Dr. Satan’s table, ready to be his next “experiment.” The final thirty seconds when she awakens and realizes where she is just might be the scariest thirty seconds I’ve e ver witnessed in any horror film. We don’t see anything, just her face and the whine of machinery, but that’s enough. This movie weathered a lot of controversy when it was released in 2003. Much of it came from young adults who think Scream and I Know What You Did Last Summer were the only models available for horror movies. But this isn’t the cartoonish efforts of serial movies like Friday the 13th and the one-liner ridden and outlandish Nightmare on Elm Streets. Rob Zombie knows what horror, real horror, is about. Yes, there is black comedy and there is camp in House of 1000 Corpses, but there’s film-making as well. Zombie isn’t phoning it in. This movie wasn’t written by a tube worm, as evidenced by the deliciously black comedic elements of naming people after Groucho Marx characters and having teenagers abused whilst wearing cute bunny suits. Horror, on any level, rarely gets better than that. Time has been kind to Corpses. 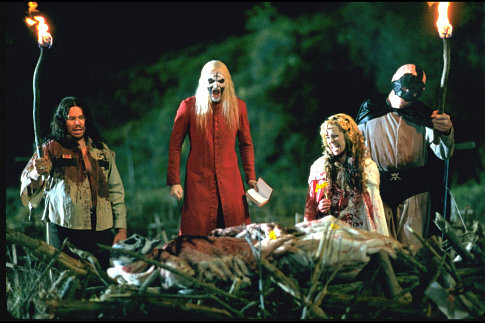 More than a decade has mellowed the original criticism it received, and Zombie made a sequel, The Devil’s Rejects, which continued the bloody antics of the Firefly family. The latter movie even made money and garnered much critical acclaim. If you’re looking for something different, a horror film that breaks the mold, and if you want to feel the walls close in on you, rent House of 1000 Corpses. Then turn out the lights and hang onto a friend. Uhh, House of 1000 Corpses was released in 2003, not 1997. It wasn’t even filmed until 2000.